Researchers have discovered a brand new dwarf galaxy orbiting the Milky Way which could give us insight into the creation of stars, planets, and even dark matter. Astronomers confirm a “star-forming object” on the side of a far-away galaxy is indeed a dwarf galaxy, and provide more insights about its nature. Dwarf galaxies come in elliptical, spheroidal, or irregular shapes, like their bigger brethren, which are believed to be formed by the mergers of multiple dwarf galaxies. With matter content of up to several million Suns, these small and faint galaxies are also a good place to investigate dark matter. The Milky Way has two dwarf galaxies orbiting it, the Large and Small Magellanic clouds, providing it with material to sink its teeth into. Recently, scientists have spotted what they think could be a third satellite galaxy in the Milky Way’s halo, between the two Magellanic clouds. Because they’re the oldest and most abundant type of galaxies, dwarf galaxies offer scientists windows into the Universe’s past and present. To deepen their understanding of how galaxies evolve and how star-forming mechanisms work, astronomers are setting their eyes on dwarf galaxies. A team of researchers from several universities in Europe investigated the nature of a star-forming object, near a galaxy called NGC 4634, and confirmed it’s a dwarf galaxy. Lying at about 62 million light-years from us, NGC 4634 is a spiral galaxy located in the Virgo Cluster, which is one of the twelve zodiac signs. For years, astronomers studied the star-forming activity of NGC 4634 and, in 2008, discovered a dwarf galaxy candidate in its halo, thousands of light-years from its midplane. Scientists suspected the object to be a star-forming dwarf galaxy but didn’t have much proof, until now. For the present study, researchers analyzed spectroscopic data from space and ground telescopes, including NASA and ESA’s Hubble Space Telescope, Giant Metrewave Radio Telescope (in India), and the European Southern Observatory’s Telescope (in Germany). 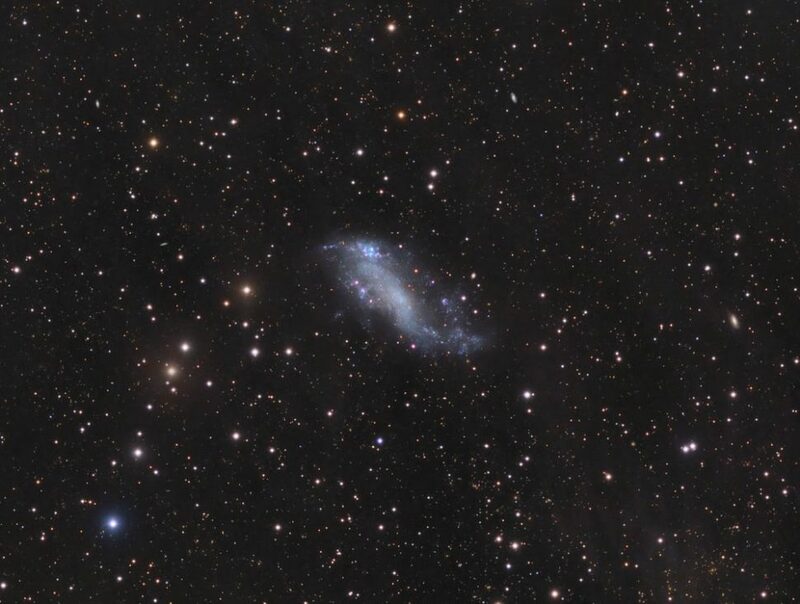 Among the findings, the team confirmed their first observations and showed that the object in the halo of NGC 4634 is a dwarf galaxy and also confirmed its star-forming activity. Around 1,800 light-years across, this dwarf galaxy has a high oxygen content that leads researchers to think it’s made of pre-enriched gas that could have originated from the disk of NGC 4634. Even with the new clues, researchers still want to make further follow up investigation of the NGC 4634-dwarf galaxy system to exclude any doubts. Full results of the study are available in a pre-print version published on arxiv.org. Are there star-forming dwarf galaxies that the Milky Way is host to?